Me and my husband visited Milan in March. One of the first places we went to was the Cathedral. I was taken aback by the beauty of it from the outside and from the inside as well. I decided to design a sweater that recalls memories of this architectural masterpiece and this beautiful city. The yoke pattern of Milano was inspired by the floor decoration of the Milan Cathedral. 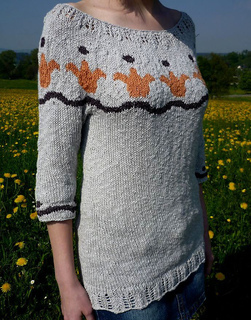 The sweater is knit in a cotton/rayon/linen blend yarn, which makes it a perfect garment for spring and summer. If you are substituting yarn, getting row gauge can be a problem, however, figuring out how many rounds less you have to knit requires only a little experience. Milano is decorated with a delicate lace border around the lower edge and the neckline. It is knit in the round from the bottom up. 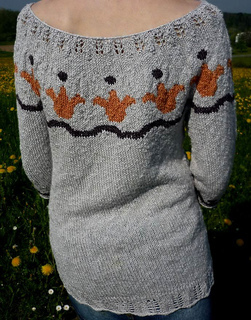 Note: the sleeves and the yoke have been redesigned, therefore the yoke is not so loose in the updated pattern as in the pictures (visible in the ones taken of the back). The new version looks basically the same, just fits better. Testers tested the updated version. 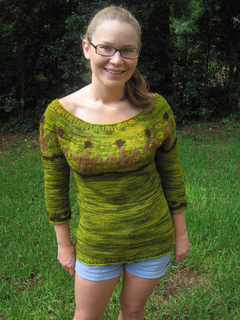 Classic Elite Yarns Summer Set - please note that yardage is about 130% higher with this yarn). Also, the tester using this yarn knitted using 4 mm needles.